Hi everyone, my name is Toby Pitman and Chris has asked me to write a post about a recent experiment that I posted up on the forum a little while ago. It all started when I was looking at the WebKit blog and saw an article on the new CSS3 animations and the one that caught my eye was 'rotate'. I started thinking what the hell can you rotate on a webpage (it's animated GIF's times ten!). Then it hit me - a clocks hands rotate! Bingo! transform: rotate; is a new feature of CSS 3 which lets you... well, rotate stuff. Transform will also allow you to scale, skew and translate (move) objects in your web page. All these can be animated by the Transition property (complete with easing and duration). Sound familiar? Well it should, it's the same thing we are currently using frameworks like jQuery to animate elements on our web pages. As with jQuery you can animate pretty much any CSS property worth animating with Transition. Think of a :hover effect and you should get some ideas. It's nowhere near as powerful as jQuery or Mootools etc but can still do some cool stuff. I doubt John Resig will lose any sleep! IMPORTANT NOTE: This demo will only work in Firefox 3.1+ and Safari 3+ (and other modern WebKit based browsers like Chrome). And no, this won't work in IE6... ever! OK let's go! First we'll need some graphics for our clock interface. We have a face and three hands. All the moving parts are sliced in Photoshop at 600px high and 30px wide and are positioned vertically dead center as by default the rotate property 'rotates' from the center of the element. You can use 'transform-origin' to set a rotate point if you want. I've gone with a generic clock thing here but there's nothing to stop you going for a Micky Mouse clock if you like. The moving parts are all PNG images making this effect possible. The mark-up for the clock is a simple un-ordered list. Each list item will hold a moving part and is given a relevant id. Here it is. NOTE: The forum post had a bit more of a clunky mark-up as it has realistic drop shadows on the hands. I've refined some of the code a bit for this demo and the forum one has been left as is. The CSS is really simple too. As the moving parts share the same dimensions and start positions we can declare these together to avoid repeating ourselves making the CSS a bit leaner. 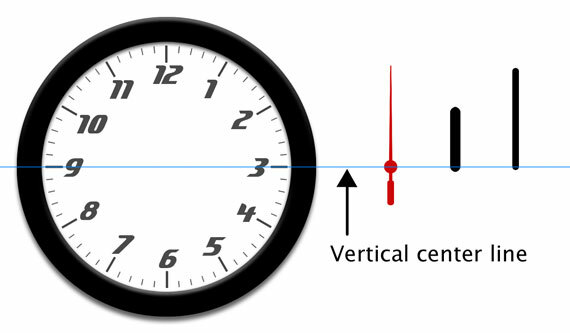 The <ul> is given a position of relative allowing us to absolutely position the clock hands inside it. NOTE: Rotate doesn't effect layout and the object behaves like an absolutely positioned element outside the normal flow when rotated. So where is is the CSS3 stuff? Well weâ€™re going to apply that using some simple jQuery. Get the timing information for the clock. Calculate and inject the CSS style (rotation angle) for each element. Update the CSS style info at regular intervals. It should be noted that jQuery has no problem at all using these new CSS3 properties. Also as the styles are allocated dynamically and not from the stylesheet this clock still validates as CSS2.1! We're going to get this info using the Date() syntax and assigning that to a variable. We can get each hands specific data by attaching GetSeconds(), GetMinutes() or GetHours() to the Date() syntax like this example. The above code will return a number between 0 and 59 and store it inside the variable 'seconds'. Next we have calculate the angle for each hand. In the case of the seconds and minutes which have 60 increments per rotation we just divide 360 by 60 which gives us 6. This means that for each second or minute we have to rotate the hand by 6 degrees. We're going to to store this equation inside another variable. For the seconds it will look like this. The hour hand throws up a different scenario. Because there are 12 increments per rotation the angle for each hour is 30 degrees. That's 360/12=30. Now that would be simple if a clocks hour hand moved in hour increments but it does't. It moves in smaller amounts based on the minute value. Say at 4:30 the hour hand will be half way between 3 and 4. So how do we do this. Here's the code. Basically we're going to add the current number of minutes divided by two which should give us a number between 0.5 and 29.5 ('rotate' can handle all floating point numbers) this puts the hand somewhere between any given 30 degree (hour) increment. I did think that the clock might explode when it got past 12 as it would be a number higher then 360 but it worked fine. So now we've figured the math lets inject the new CSS. Here is the CSS3 rotate as if it were in a style sheet. Here it is injected by jQuery (NOTE: As of jQuery 1.8, the proper vendor prefixes will be applied when using the .css() function. Older versions of jQuery will need to apply them manually). The problem we have here is getting the variable 'sdegree' (which holds our angle) into this syntax to replace the (45deg). At first I just tried putting the variable between the brackets but it wouldn't have it. To make this work we need to build a 'string' inside another variable called 'srotate' and completely replace the second argument. Here's how we make it. The jQuery will now be written as this. The whole jQuery code looks like this. Our clock should now work (in Safari and other modern browsers). Flash is the obvious one but unless you've got ActionScript chops I'd give it a swerve. This may even be possible with PHP using the GD image library to rotate the hands but that's way above my level. UPDATE Nov 2012: Daniel Bakan has a very similar article "How To Write a Full Screen Web App Optimized For iOS Devices" in which he builds an old timey clock as well. If you're super interested in this, that's worth checking out as well. So there you have it folks, a real and (probably the only) practical use for the new CSS3 property transform:rotate. I for one can't wait for upside down and sideways websites (Yes, you can even rotate the HTML tag! Although look what that does to Safari) and my personal favorite the spinning/zooming cartoon newspaper blog posts. So go on, give some of those new CSS3 features a try! Sweet I love this some great use of JQuery and CSS could really be helpful. But use this plugin for jquery for use this script with more browser? but then there are so many thinks which dont work in IE. one more so. @moksha-Did you read the article? This only works in Safari and Chrome. Its not really meant to be practical at this point in time, just fun and innovative. Great article, this was a lot of fun. Keep more css3 fun coming! :) It doesnt work in firefox, i'm looking at safari now. And by the way it also seems to work in Google's Chrome browser. This is really cool! I especially love the screenshot on rotating the html tag. Cool!! Good job Chris. Everybody can learn simply everything about css and jQuery when do this example. Thats a nifty trick. God but it just scares me how many browsers there are now. Why won’t the regular CSS expression work? I mean what if we want to animate… “this”, “attribute” seems kinda odd. Great job, but In IE 11 its not working. I use the following changes then it work fine in IE 11.